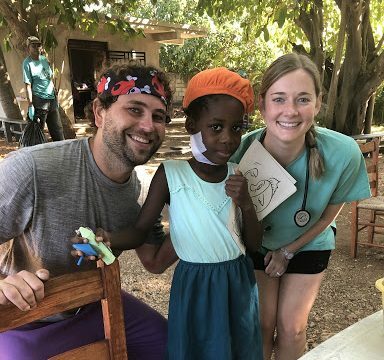 I first came to Haiti 5 years ago with no medical background, but I was excited to help in any way possible. A man came in with a large infected wound on his ankle, and a team member asked me to help clean it. It’s likely his foot would have been amputated in the US, but that wasn’t an option in Haiti. We did what we could, but at that moment I knew I wanted to learn more. I decided to get certified as an EMT with the hope that I’d be able to provide better care on future visits. Today I was working in wound care when a man came to get his foot treated. As I began to soak and scrub, I realized it was the same man (and the same wound) that changed my life 5 years earlier. The person I assisted on the original trip is now our team leader. I have no idea how many people have cleaned his wound over the past 5 years, but his smile let me know how much he appreciated each and every one of us.